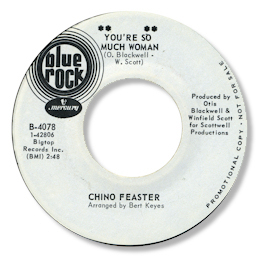 New York artist Chino Feaster had his first disc issued under the name “Chino Feather”. “Say You’ll” was a strong if primitive R & B uptempo workout, with the flip being a more restrained song with a mambo beat. His first 45 under his more usual name was a great double sider that appeared on Blue Rock. The more celebrated track is the fine uptown beat ballad A Grown Man Cry with its lovely bluesy tinge courtesy of a fine guitarist. The nominal A side was at least as good. You’re So Much Woman is in similar vein but has a more impassioned vocal, and a really big sounding arrangement from veteran Bert Keyes – just love that baritone sax pumping away. 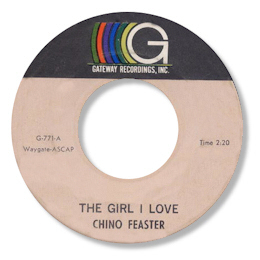 Feaster’s other two 45s both feature the dancer “The Girl I Love”. I’d guess the Shipp was the first release as it doesn’t feature the overdubbed xylophone intro. 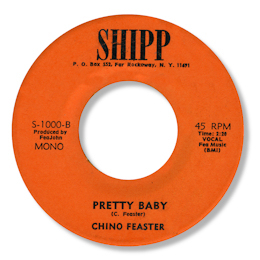 The wah wah guitar dates this track to the early 70s, but the fine R & B “Pretty Baby” sounds as though it was held in the can for a number of years before seeing the light of day. The flip to the Straker’s single is a funky little track that comes from the 70s as well. which would put the Blue Rock as his last release and all of them into the 1960s. Again he maywell be right if the "wah wah" guitar on thew Shipp and Straker's singles is very early. I'm very grateful to Naoya as wlawys for the images and the soundfile of the Gateway 45 as well as for the info. 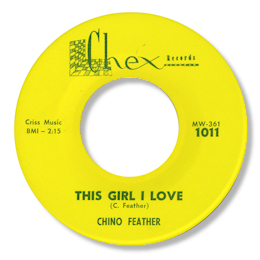 Also Davie Gordon writes to say "That Chex single is on a Detroit label, home to the Volumes. Given that label owner Willie Ewing gets a co-writer credit it was probably recorded in Detroit. Maybe Chino relocated from Detroit to NY." Davie may well be right about that - he is a mine of great info and I'm grateful to him for sharing his knowledge. Note - You can find "A Grown Man Cry" on the Mercury double CD "The Blue Rock Records Story".